First of all, I want to thank all of you for the overwhelming support regarding my upcoming cookbook. I was blown away by all of the positive response and so touched by those of you who mentioned that Keepin’ It Kind has been helpful in your transition to veganism. I’ve been literally (ok, figuratively) (I’m trying not to abuse the word “literally” anymore. It’s this new thing I’m trying) floating on giddiness the last few days! You all are simply the best. The. Best. I’m so enthralled with all of you right now that I wish I could invite you over so you could share this dip with me. Because, holy moly! This dip, you guys. 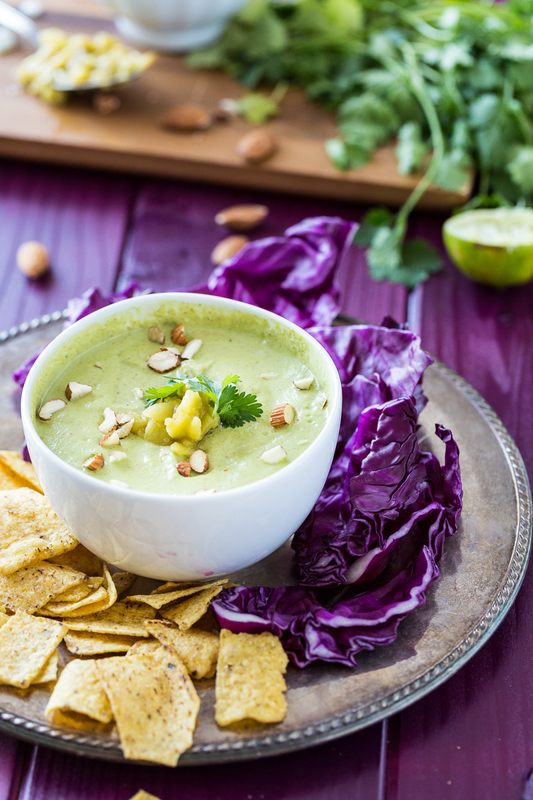 There’s no arguing the fact that the best green dip out there is guacamole. It’s a well known fact. It’s science. 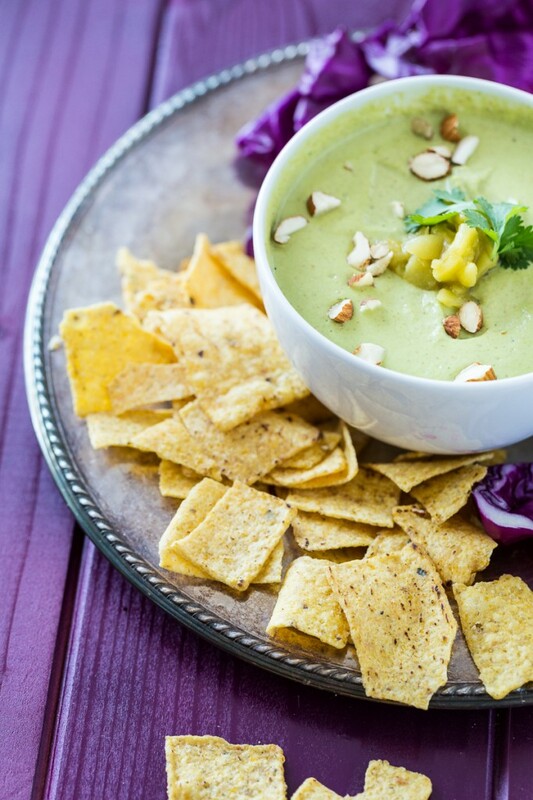 But if science were to signify a 2nd best green dip in the world, it would be this one. It all started at a sample station at Whole Foods a couple of months ago. There was a dude giving samples of a new sauce called Bitchin’ Sauce. When he asked if we wanted a sample, I asked if it was vegan like I always do and I waited for him to quietly withdraw with “Actually, no. Sorry.” Instead, he surprised us with “Absolutely! And it’s gluten-free!” So we tasted his product and just like that, we were addicted. We bought a container of the Cilantro Chile flavor on the spot and we were on our way. 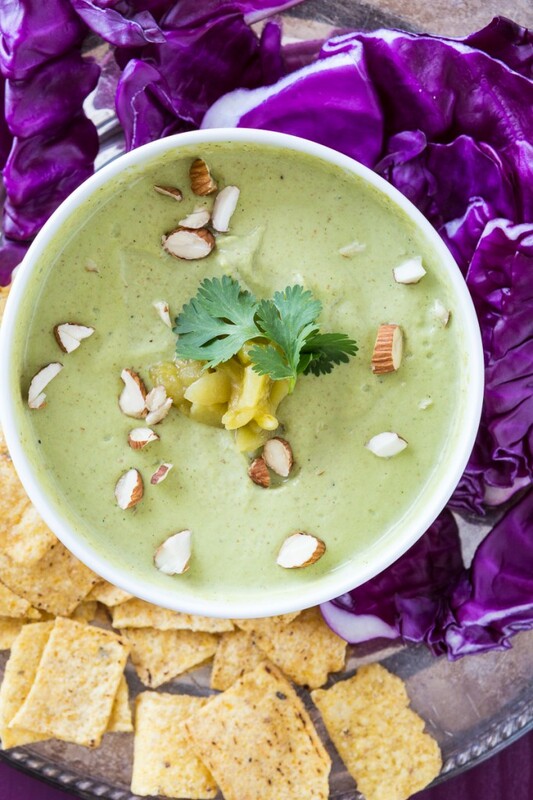 This dip became our new favorite thing. It was thick and creamy while still being light and refreshing. Neither the cilantro or chile flavors were overpowering but there was something about it that made us keep coming back for more. I loved that all of the ingredients were items I had in my kitchen already so I began trying to use those ingredients to replicate it. We kept buying more of the dip (for the sake of science) and we would taste it side-by-side with my rendition until I came up with a version we actually like better than the original. That’s when I knew I had to share it with all of you. The amazing thing about this dip is its versatility. 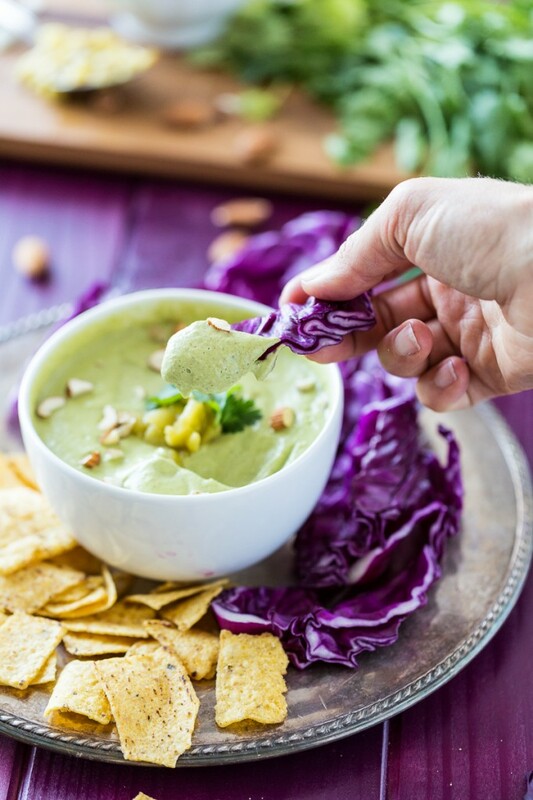 Our favorite thing is to dip red cabbage leaves into it, though other veggies and chips work just as well. It also makes for a luscious spread for toast and/or sandwiches. You can add a couple tablespoons of water to thin it out and use as a sauce or salad dressing. I particularly like spooning it, as-is, over a bowl of roasted veggies, beans, and rice. 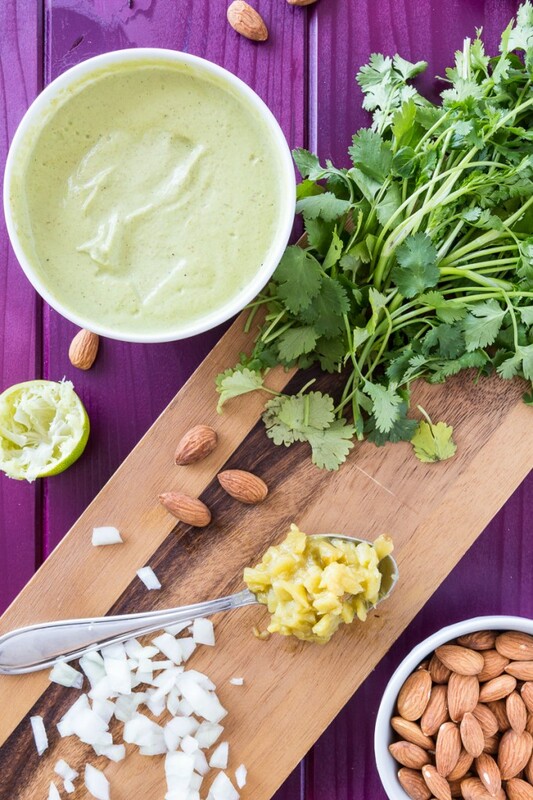 It’s basically become one of our go-to dips/sauces this summer. 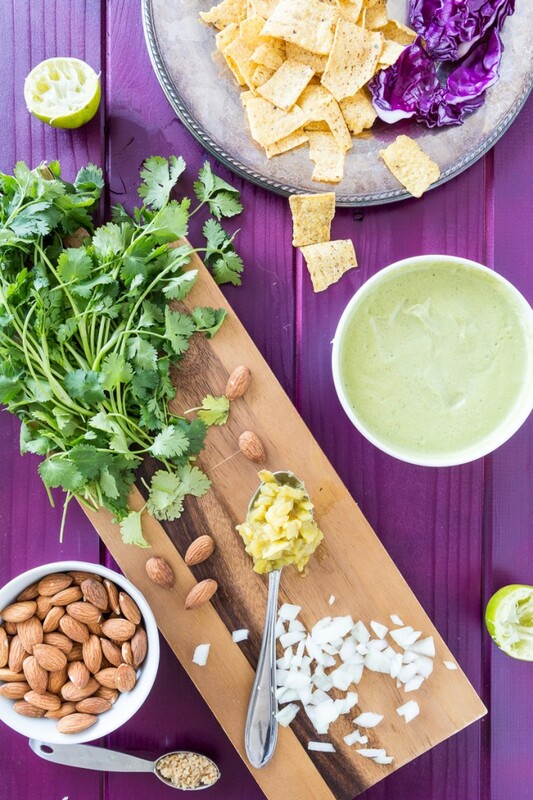 Don’t wait any longer- Get this awesome (it will literally inspire awe) cilantro chile almond dip in your life now. And put it on everything (figuratively speaking) and watch your life get really, really great. You’re welcome. Combine all of the ingredients in a high-speed blender or food processor and blend/process until smooth and creamy. Transfer to an airtight container and refrigerate for 1 hour prior to serving. It will keep for up to 4 days. If you don't think you will be using it all within 4 days, the recipe is easily halved. To use as a thinner sauce, add water by the tablespoon until it drips easily off a spoon. 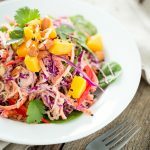 To use as a salad dressing, you can add all water or alternate adding water and rice wine vinegar by the tablespoon until it drips easily off a spoon. For a more savory sauce, blend in another tablespoon of liquid aminos, a teaspoon of white miso paste, and then add water by the tablespoon until it drips easily off a spoon. 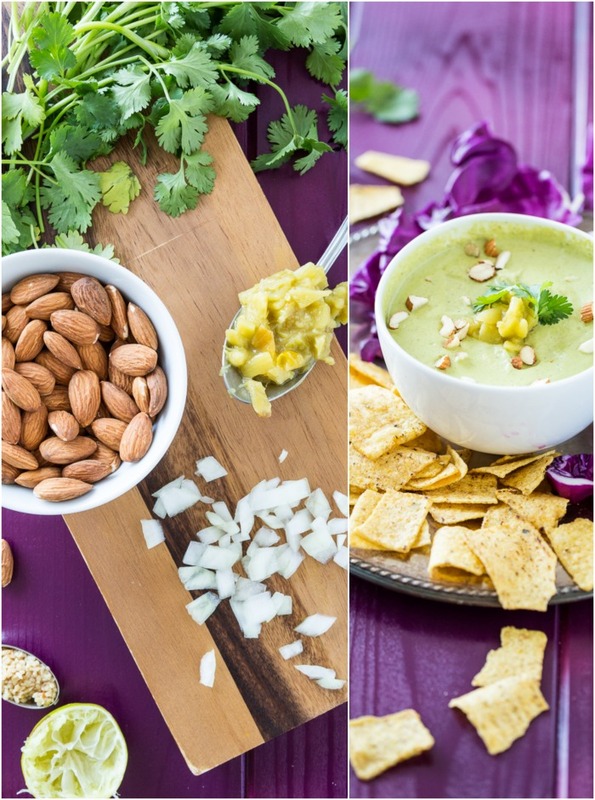 21 Responses to "Cilantro Chile Almond Dip"
I’m one of those people who lovesss cilantro, so I’m so into this! I love Bitchin’ Sauce! They’re at the farmers markets here in San Diego. I can’t wait to try this, it looks amazing!!! You should make a version of their Chipotle flavor next — we like to marinate tempeh in that one and then grill it. Life. Changing. This looks awesome Kristy! I do want to dip everything in it (not figuratively speaking!). Totally in love with these pics too. 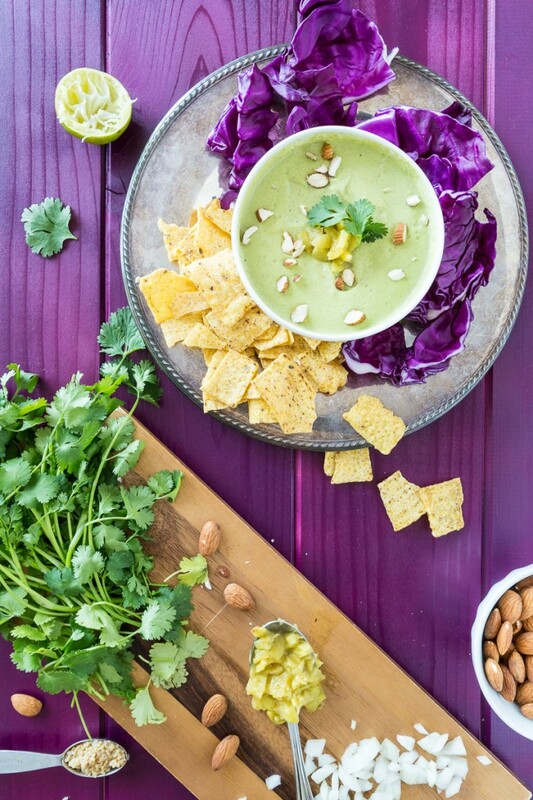 Green and purple are a great pairing. This looks creamy and so delicious! And I love how you dipped in red cabbage – never thought of that before but what a great idea!! This looks awesome! I have limes on my tree right now. Will try it this weekend. Thanks for sharing! Hold the phone. 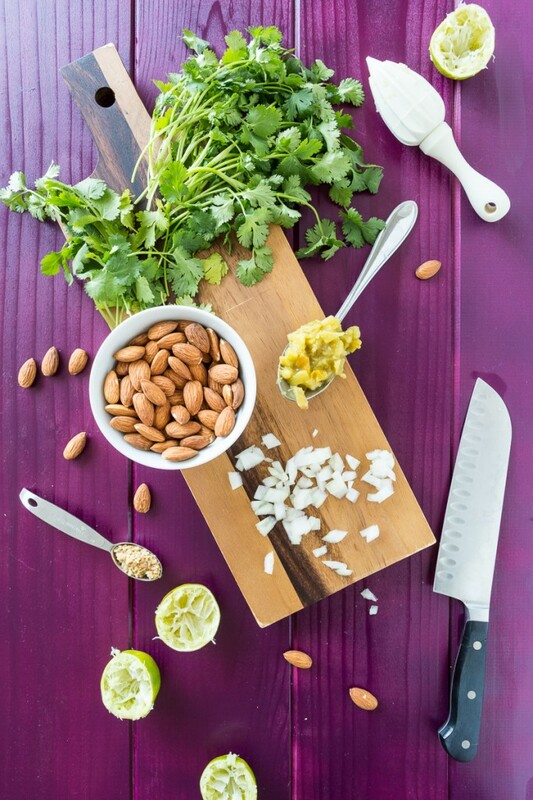 Almonds + chile + cilantro? Are you CRAZY? I’ll have to get these ingredients, ya know, to test how crazy you are (a/k/a eat the entire bowl). You rock! It’s always great to find a new, reliable, go-to staple. Will definitely be trying this ASAP! Love your photos! Always the Whole Foods’ samples…they get me every time. The other week I left with $15 worth of unplanned sorbet (it was worth it). Your dip sounds fabulous! I am really loving raw red cabbage right now – why have I not been using it as chips?! I made this dip using the “savory” option for a sauce over fresh zucchini noodles. Wow!!! Thanks for a great recipe. That looks yummo! I have to say I’m a stereotypical vegan and I just looooooove a good hummus – there is this brand here in Oz that makes a jalapeno hummus that is to die for. I don’t know why, but I’d have never thought to use almonds as a dip. The things you can do with ingredients. Looks delicious! Thank you so much for posting this recipe! I am deathly allergic to avocados, and have lived for years without guacamole. I understand it tastes fantastic. Well, now I can have something that I’m sure will taste equally fantastic! So excited to try this! Thanks again! wonderful presentation here… my mouth is watering! This looks delicious! I’ve actually been on the hunt for a recipe I can use when I have leftover almond meal. I make almond milk every week, and I never do anything with the meal. I always dry and refrigerate it, but then it just sits there… and I end up feeling guilty for wasting it. Does anyone have suggestions for adjusting the recipe to account for almond meal versus whole almonds? Would I need to use more water? I’ve never tried to substitute one for the other. That’s a great idea, Stef! I haven’t tried it but you may be able to sub some of the almonds for almond meal. I don’t have much experience with that, though. Maybe someone else will have some input. If you try it, I’m curious to know how it goes. Good luck! I have been looking for a recipe to replicate the Bitchen sauce, thx! I don’t have these ingredients right now, will substitute basil for the cilantro and use lemon instead of lime. This was delicious!!!! thanks so much for posting! Served this over blanched riced cauliflower along with portobello mushrooms (sauteed with garlic, soy sauce and cilantro) and cilantro-lime rice (probably more cilantro in one meal than most would like–but I can’t get enough of the stuff!). Oh no! Don’t have enough almonds on hand, can I sub cashews? So I love the store version of this dip. It’s six dollars a tub and my local vendor often runs out . First it was too soupy, Second it had no kick to it at all. I added more almonds and adjusted the spices, cilantro, lime juice etc. but I’m wondering where the kick in the original version comes from. Chilies presumably. Do you think I should’ve used fresh chilies instead of canned?